The Bowdish lab is on a roll! This past month has been very productive in the Bowdish laboratory, with many triumphs achieved by it’s industrious members. Firstly, a big congratulation goes to Kyle Novakowski, the Bowdish lab’s newest PhD student. Following a lot of hard work, determination and great dedication to his Masters project, Kyle successfully passed his transfer exam on July 7 and has officially begun his seemingly endless exciting pursuit for a PhD. Good luck to Kyle in continuing his interesting investigation on the regulation and function of MARCO! Dessi Loukov presents her undergraduate work in the Bowdish lab at the 1st annual Perey Symposium, convinces everyone she’s a senior PhD student and brings home the Faculty choice award for best speed poster presentation. Next up is Dessi Loukov, who is currently an undergraduate but come September will be the Bowdish lab’s 4th PhD student. 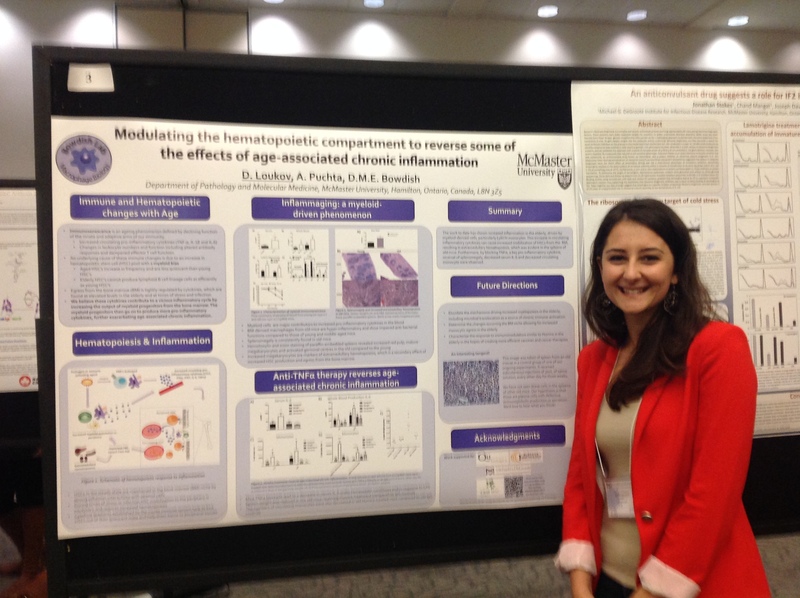 At the 1st annual MIRC Perey Symposium held on June 19, Dessi impressed faculty and trainees with her educational and enthusiastic speed poster presentation on modulating the immune system to potentially reverse age-associated inflammation. Dessi was awarded a travel award as a result of her superb presentation skills. Kudos also to Fan Fei (PhD candidate) and Avee Naidoo (MSc candidate) who gave excellent speed poster talks and Dr. Chris Verschoor who gave an excellent oral presentation. Who knew that research in inflammation could be so exciting? The Bowdish lab, that’s who! One PhD candidate who deserves great recognition for his recent successes is Mike Dorrington. Not only was Mike awarded with a prestigious and well-deserved Canadian Lung Association & Canadian Thoracic Studentship, but he additionally achieved received The Ruth and Wilson Tafts Prize for Immunology for having the best paper published in a peer-reviewed journal in 2013. Geez Mike, save some awards for the rest of us. These awards will be used to further fund his fascinating work on the role of macrophages – clearly, the best cell around – in recognition and clearance of Streptococcus pneumoniae in the upper respiratory tract. Congratulations Mike! At the celebration of Mike’s first first author publication. Although Dawn is mostly happy for Mike, she is also slightly nervous that she might be about to lose an eye when the champagne is opened. 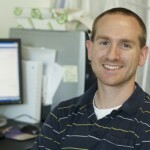 Then, there’s Dr. Chris Verschoor, the lab’s most productive and well-rounded member. 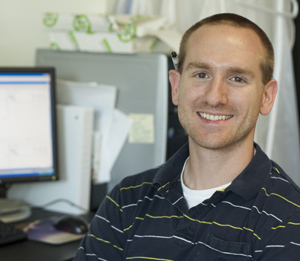 Chris’ paper entitled, “Alterations to the frequency and function of peripheral blood monocytes and associations with chronic disease in the advanced-age, frail elderly“, was recently accepted into the PLoS one. If you’re interested in changes in monocyte populations with age – I mean, who isn’t? 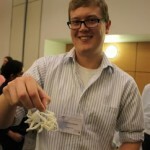 – keep a look out for Chris’ article in the next issue of PLoS one . Way to go Chris on this well-deserved publication! 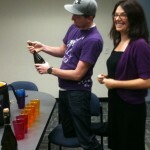 <- Manuscipt accepted = happy post-doc. And last, but definitely not least, the lab takes great pleasure in congratulating our passionate leader, Dr. 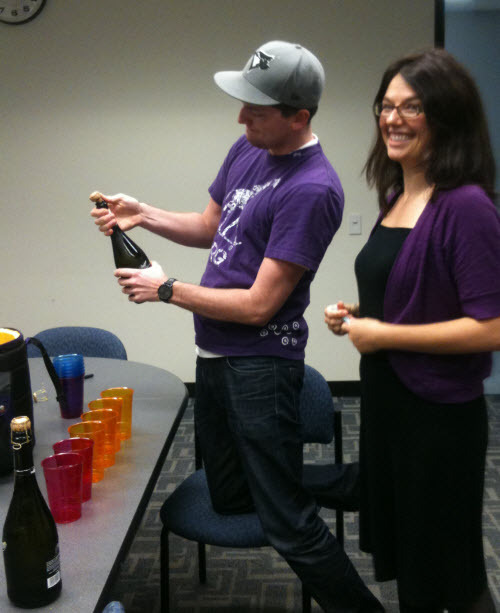 Dawn Bowdish, who has been awarded tenure and a promotion to Associate Professor effective as of July 1, 2014. This accomplishment is a fitting acknowledgement of Dawn’s exceptional work, devotion and academic contributions to research in the field of macrophage biology. In addition to her promotion and tenure, Dawn recently received a Best Teacher Award in the Department of Pathology for excellence in undergraduate teaching and graduate supervision. Well-done Dawn! 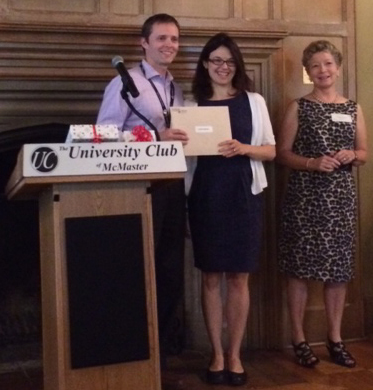 Dawn receives the Pathology & Molecular Medicine Department’s best teacher award for her undergraduate and graduate supervision. Dr. Murray Potter, the education co-ordinator and Dr. Fiona Smaill, the chair, present her with the award. 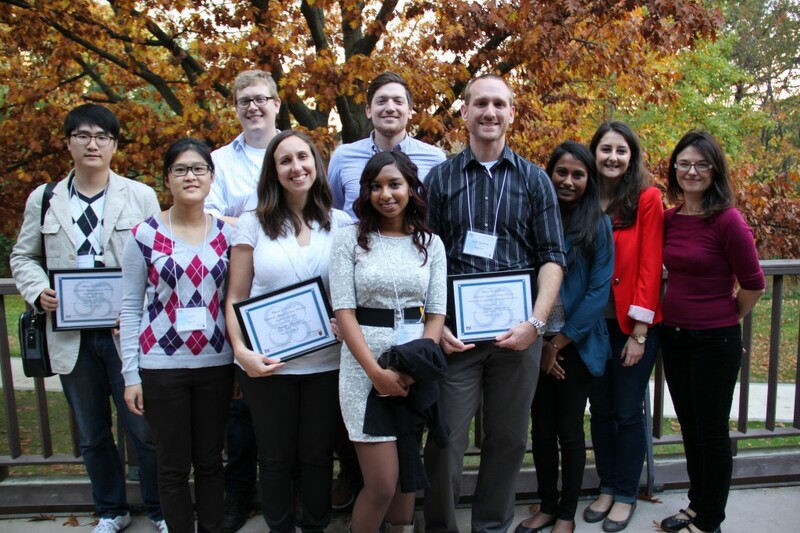 Congratulations Bowdish lab on our successes! Alumnus update: Prashant Bharadwaj accepted to John Hopkins University for graduate school. Prashant Bharadwaj (Summer 2013) was an undergraduate from the Indian Institute of Technology who won a MITACS summer studentship to work in the Bowdish lab discovering novel signalling motifs in macrophage scavenger receptors. He will be joining John Hopkins as a graduate student in September 2014. Way to go Prashant! The Bowdish lab cleans up at the IIDR trainee day! Well it was an impressive show even for our over achieving lab! Bowdish lab undergraduates (Netusha Thevaranjan, Dessi Loukov, James Han), graduate students (Kyle Novakowski, Mike Dorrington, Fan Fei), post-docs (Dr. Chris Verschoor) and associates (Fiona Whelan, Dr. Jennifer Stearns, Michelle Pinto) all got selected to present posters at the IIDR trainee day. James Han won the IIDR Award of Excellence for best poster by an undergraduate and Dr. Jennifer Stearns brought home the award for best poster by a post-doc. Avee Naidoo was selected to give a talk only 6 weeks into her graduate degree and Dr. Chris Verschoor won the Gulliver award ($1000!) for the best oral presentation by a post-doc. What a great day! For a complete album of photos, click here. 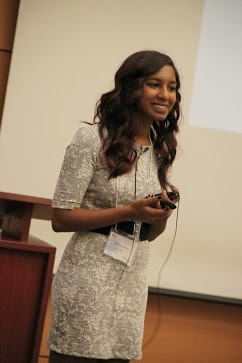 Avee Naidoo gives her first talk on her project – 6 weeks into grad school! Dessi Loukov presents her poster and gets lots of compliments on her story. 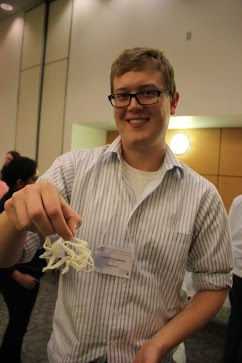 Dr. Chris Verschoor wins the Gulliver award for best presentation by a PDF. 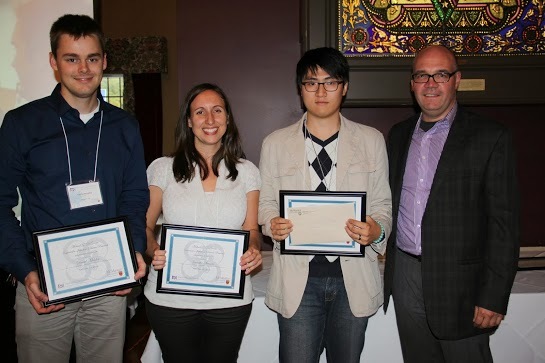 Dr. Jennifer Stearns and James Han win IIDR awards of excellence for their poster presentations. 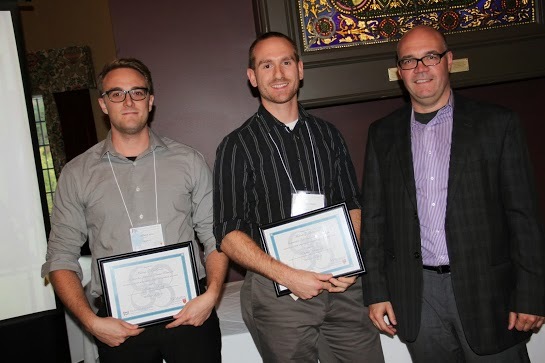 Alumnus update: Former Bowdish lab undergraduate, Keith Lee, receives a CIHR MSC scholarship! Keith Lee, who will be attending the University of Toronto for medical school starting August 2013 has received a very prestigious CIHR MSc graduate award. He has chosen to decline to pursue his medical studies and potentially re-apply as an MD/PhD student next year. Congratulations Keith! Collaborator update: Fan Fei wins “Glasgow Polyomics & University of Strathclyde Young Scientist Award” at the 9th Annual Conference of the Metabolomics Society! Fan Fei (PhD candidate), under the supervision of Dr. Brian McCarry, and in conjunction with Bowdish lab undergraduate Keith Lee, studies age related changes in the inflammatory response from a metabolomics perspective. Funded by the Russell Bell Travel Scholarship award, she attended the 9th Annual conference of the Metabolomics Society. July 1-4, 2013, SECC Glasgow. She won the “Glasgow Polyomics & University of Strathclyde Young Scientist Award” for outstanding poster presentation of research in the field of metabolomics at the Metabolomic Conference 2013 in Glasgow Scotland for her work “Comprehensive Metabolomic Analysis Reveals Major Differences in the Macrophage Inflammatory Response Between Young and Aged Mice”. Way to go Fan! Changing of the undergraduate guards. The changing of the guards (or at least undergrads) happened this summer in the Bowdish Lab. We wish our departing undergraduates Keith Lee (onwards to medical school), Samanthy Balachandran (onwards to graduate school) and Peter Mu (radical that he is – onward to getting a job!) all the best in their future endeavors! The Bowdish Lab is excited to welcome our new undergraduate students Prasant Bharadwaj, a MITACS summer student from India, James Han, an iSci student, and Dessi Loukouv, a co-op student working collaboratively with Qu Biologics. Netusha Thevaranjan will be staying on as a summer/thesis student. Peter Mu, Samanthy Balachandran and Keith Lee – the 2012/13 crop of undergrads as they move on to their next adventure. 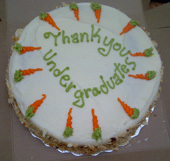 Nothing says “Thanks for all the hard work” like carrot cake. The Bowdish lab is now accepting applications for undergraduate summer/thesis students. It may seem early, but the Bowdish lab is now looking for undergraduate students for summer 2013 and the 2013/2014 school year. Generally the model in our lab is to have a student apply for a summer studentship and work full time then continue on as a thesis student. See the FAQ page for requirments http://www.bowdish.ca/lab/faq/. Immunology, especially animal models of infection. 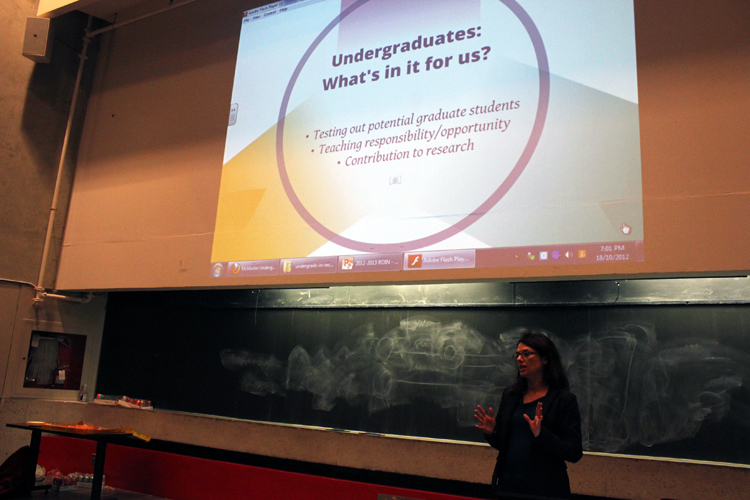 Students will be expected to apply for external summer funding (e.g. NSERC-USRA, departmental summer studentships and other). For all other questions on qualifications see the FAQ page http://www.bowdish.ca/lab/faq. Interested candidates should read the FAQ page and provide Dr. Bowdish with a c.v. and brief reason for why you would like to be part of the Bowdish lab. Dawn presents her perspectives on why a PI might take an undergraduate researcher and what an undergraduate might do to obtain a research position and be successful in research.